For the second time in a standalone Dallas Cowboys game this season, we lost a seven-and-a-half-point pick on a game that landed with an eight-point margin for the favorite. That said, our first-half prop with Kansas City hit, and so we salvaged a 1-1 week that has us at 9-4-1 over the past five weeks. With the KC over 14.5 first half win, we’re 24-18-2 on our “Lock of the Week” picks since the start of 2017 (57.1%). We’re 82-74-8 (52.6%) on all of our picks since the beginning of 2017 and 63-51-6 against the spread (55.6%). Our Las Vegas SuperContest picks went 48-36-1 (57.1%) this year (team name #Bet Against___). The analyses below will involve a point-counterpoint between the two of us for all five picks, using perspectives that only the PFF grades and data can provide. Follow us on Twitter at @PFF_Eric and @PFF_George, and for some podcast commentary on some of these picks, the Lock of the Week, and the process that goes into them give the PFF Forecast a listen. We will have a special Monday morning podcast each week with look ahead lines for the upcoming week. Point (Eric Eager): We had this game previously, with the Saints winning outright and covering after the line hopped around zero all week. Much has changed since, with both New Orleans and Los Angeles showing their warts in prime time, with a collection of injuries to key players that seems to have had the biggest effect on the Rams. The most stable and predictive quality for a quarterback is his proportion of negatively-graded dropbacks and pass attempts. Drew Brees is the best quarterback in this statistic in the NFL, generating a negative grade on just 7.8% of his dropbacks so far this year. Jared Goff, on the other hand, is generating a negatively-graded dropback on 13.2% of his opportunities, the highest mark of the remaining quarterbacks this year. The Saints have an underrated and decided edge at the league’s most-important position Sunday in the dome. For those who would like to chase the 48-carry, 273-yard rushing game by the Rams last Saturday, note that the 5.7 yards per carry represents a mark that is less than the 6.6 yards per pass attempt the Rams averaged in a game where Jared Goff was ok, but not great. The Saints defense has the third-best success rate allowed on early-down run plays this season, and the second-best overall yards per carry, meaning that the Rams will have to (and will, given that they are smart) put the ball in the hands of their third-year signal caller. I’m skeptical as to whether that will bear fruit against a defense that shut out Saint Nick over the last three-quarters of Sunday’s game. Counterpoint (George Chahrouri): Revenge is a powerful weapon. Some might say it is more powerful than even C.J. Anderson. Both of those will be at work in the rematch of the Week 9 game where the Saints won 45-35. The final score of that game overshadows what really happened, however. Tied at 14, the Rams executed a brilliant fake field goal on fourth and four from the Saints 22 only to have the refs spontaneously burst into a Bird Box challenge and call Johnny Hekker short. 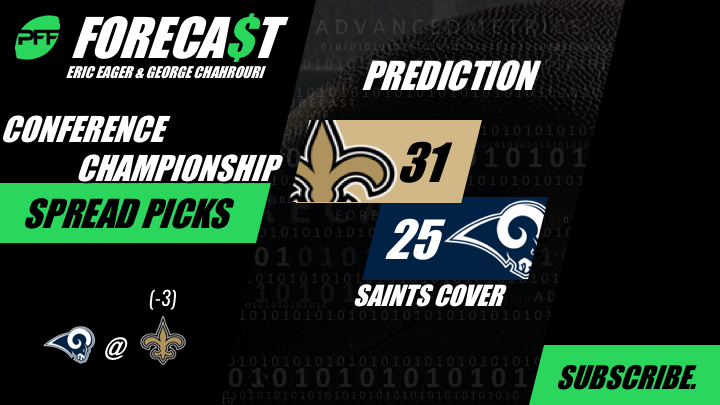 The Saints then scored a seven-pointer and later turned Goff’s lone interception, a once in a lifetime play by Tony Anzalone, into another 3+3+1 and entered the half up 35-17. The Rams would storm back to tie it at 35 before running out of gas down the stretch. The 10-point Saints win could easily have gone the other way, and it overshadowed Jared Goff’s brilliant performance in which he averaged 11.2 yards per pass from a clean pocket. Another forgotten tidbit that hasn’t received nearly enough media attention is Marcus Peters getting smoked by Michael Thomas for 146 yards on nine targets. With Aqib Talib back in action, the Rams have gone from allowing a 123.3 passer rating from a clean pocket (31st) to just 85.5 (sixth, though they did get to face Mitchell Trubisky and the Chicago Bears‘ complementary attack). Aside from his former shoe-shiner getting a head-coaching job, Sean McVay’s brilliance does actually manifest itself on the football field. Running the most play-action and jet-motion in the NFL this season, the Rams have feasted on easy throws for Jared Goff; those concepts boost yards per play by approximately 1.5 and 0.5 yards, respectively. Point (GC): The spread in this game insinuates that the Chiefs and Patriots are equals on a neutral site. This is noteworthy for two reasons. First, the Chiefs (not the Patriots) are actually the team that is being underrated by the public, making them the pseudo-underdog. Second, the Chiefs are unequivocally better than the Patriots overall and particularly on offense which, as it turns out, is the most predictive facet of football. The combination of Patrick Mahomes and Andy Reid is truly unmatched; they combine genius play-design with the ability to make magic happen outside the structure of the play. The Chiefs rank first in yards per play on their first two drives (7.4), and they are the only team to score on 50% or more of their first two drives (16 for 32 this season). They also average the most yards per play on quick game concepts and screen passes, while Mahomes ranks first in percentage of targets to receivers with a step or more of separation and passer rating from a clean pocket, all of which are testaments to Andy’s brilliance. Pat’s love for Reid is not surprising given that he’s admitted to loving another oddly shaped bottle that is red all over, and the results on the field go a long way to supporting that. Mahomes has been classified as somewhat of a gunslinger; the belief is that he will throw you a couple during a game and you just have to take advantage. Since the Rams game, this has simply not been the case — he ranks second to only Drew Brees in avoiding negatively-graded throws since that game. Brady, on the other hand, ranks 13th in that area this season. Perhaps the number is lower because of Kareem Hunt’s absence. LOL. The Chiefs averaged the same yards per rush with him in the lineup as they have without him. Some things do matter, and one of them is the Chiefs pass rush that owns the second-most productive pressure trio since Houston’s return. While the Arrowhead advantage is a bit overblown, the crowd noise should definitely help the Chiefs’ pass rush get a jump on the Patriots’ offensive line that kept Tommy squeaky clean last week. He may be pliable, but elusive he is not. Chiefs move on to the Super Bowl decisively. Counterpoint (EE): New England was the right side of the game between the Chiefs and the Patriots in Week 6, and while the Chiefs came away with the cover, a blueprint for beating the Chiefs was laid out for New England. After their drubbing of the Chargers last week in Foxboro, the Pats ascended to a tie for first (and second in the NFL) in early-down EPA per pass play (+0.22). As we talked about on the SI Gambling show and the PFF Forecast last week, Tom Brady was leading the NFL in percentage of third-down passes that were dropped going into last week, something that is not particularly stable year-to-year or even game-to-game, so it’s savvy to pay more attention to the early-down success for the Pats, which has been good. While the Chiefs’ defense has played great at home this season, their two best opponents there have been the Chargers and the Colts, and the biggest personnel benefit for them down the stretch has been the improvement of undrafted rookie Charvarius Ward, a player whose weaknesses Bill Belichick will be more equipped to exploit than anyone. While the Colts were unable to take advantage of the likes of Anthony Hitchens and Reggie Ragland last week, the combination of James White and Sony Michel could give the Chiefs’ defense fits over the middle of the field as well. I like that we’re on the Chiefs side in this one, but there’s certainly a case to be made for the two-time AFC champion here, so buckle up.